Description: The first book in the captivating, #1 New York Times bestselling Selection series! 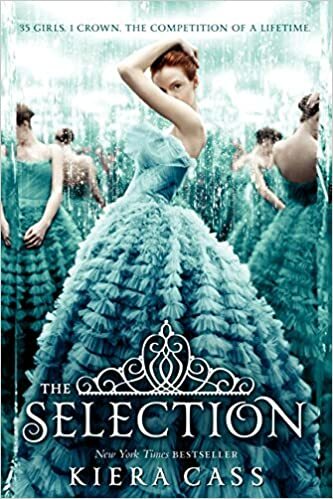 Discover a breathless fairy-tale romance with swoon-worthy characters, glittering gowns, fierce intrigue, and a dystopian world that will captivate readers who loved Veronica Roth’s Divergent, Ally Condie’s Matched, and Lauren Oliver’s Delirium. My Thoughts: I enjoyed this story very much. I liked America who really didn't want to win the handsome prince preferring the boy of the lower caste that she has known and loved for years. But he pressures her into signing up by convincing her that he would feel guilty if she let the opportunity pass her by. She is also being pressured by her mother who loves her but wants her to better herself it it is possible. America signs up never believing that she would be one of the thirty-five girls chosen as potential mates for the prince. Once chosen, she is still determined not to marry the prince. She has a distorted vision of who he is. It isn't until he comes to her rescue when she is having a panic attack that she learns that the prince isn't at all who she thought he was. She still doesn't want to marry him, but she offers to be his friend. Friends are something neither of them have had before. This was an interesting society where people are born into castes which dictate what sort of job is available to you. America's caste is composed of artists of various kinds. America is a singer and plays lots of instruments. Aspen, her first love, is one caste lower and is in service to anyone who will hire him. None of the lower castes, America's or Aspen's have enough to eat. That is one incentive for America to take part in the Selection, the meals at the palace are far beyond what she can get at home. Life isn't idyllic at the palace. There is some rivalry between the girls who are competing for the prince though most of them do become friends. There is the requisite mean girl in the story who makes life harder for America than it would have to be. But the main problem is rebels who attack the palace. There are two factions - the North and the South. One faction seems to be searching for something in the palace and the other just seems bent on destruction. This was a great beginning to a series and I am eager to read more books to find out what happens to America and which boy she chooses. I'm rooting for the prince. Something in his voice struck me. There wasn't a trace of sarcasm. This thing that seemed like little more than a game show to me was his only chance for happiness. He couldn't try with a second round of girls. Well, maybe he could, but how embarrassing. He was so desperate, so hopeful. I felt my distaste for him lessen. Marginally.